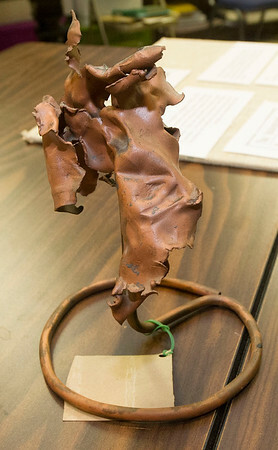 A mangled piece of metal that owner Mary Louesa <>Estes calls "instant art" sits on a table at the Powers Museum on Tuesday. Former Hercules employee Ray Trowbridge said the copper piece is more tha likely part of an angel buggy used to transport explosives. Estes' husband, Forrest Estes, was a 36-year employee at the plant.